This exciting full production of Wagner’s masterpiece in one act is not to be missed! Under the creative direction of Issac Selya, Founder and Artistic Director of QCCO, and WSC members providing support in set design and construction, marketing and promotion, stage direction, and prop development. 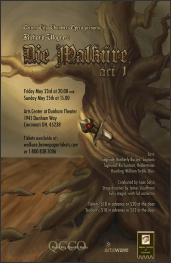 Ticket information: (800) 838-3006 or walkure.brownpapertickets.com. Project support provided by a grant from ArtsWave.